Our property is managed by a reputable and long established agency, situated in Quinta do Lago, if there is anything you require whilst in the resort. 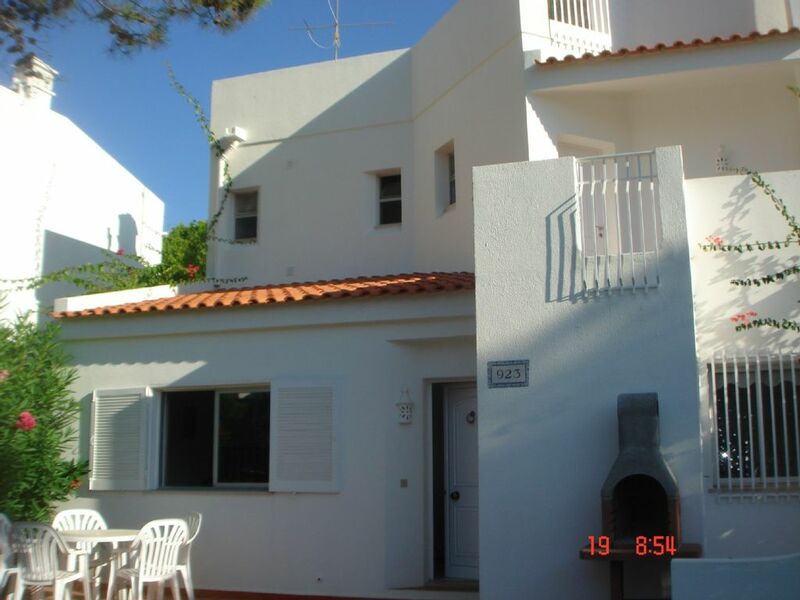 A spacious and well maintained 3 bedroom house situated in a peaceful location in Vale Do Lobo, 2 minute walk from the excellent Vale do Lobo Tennis Centre. On the ground floor there is a spacious lounge and dining room, a newly fitted kitchen. 1 twin bedroom with newly fitted shower room attached. Large patio area to front of house with dining furniture.Staircase leading to 1st floor with large double bedroom, 1 twin bedroom and newly fitted bathroom, fitted wardrobes in all bedrooms. South facing terrace with garden furniture. Further staircase leading to a sun trap roof terrace with 2 sunbeds and cushions. A fully equipped kitchen, washing machine, dishwasher, oven, hob, microwave, all kitchen utensils, DVD player, radio, WIFI, Digital TV, weekly maid service. Vale do Lobo - The Resort: Warmed by the best sunshine in Europe with 3,000 hours a year, the Algarve, Portugal's southern most province, has more than 150 kilometres of golden coastline washed by the clear, blue Atlantic Ocean. Situated in the heart of the Algarve, Vale do Lobo is three times the size of the Principality of Monaco. The rolling golf courses and international restaurants nestle among pine forests and above the pristine beaches that for centuries have adorned this corner of paradise. A holiday at Vale do Lobo will be both refreshing and enjoyable. Golf and leisure facilities: The house is situated in close proximity to some of the finest golf courses in the world, including Vale do Lobo Ocean and Royal Course, Pinheiros Altos and San Lorenzo to name but a few. These courses are also home to some fabulous restaurants and bars, along with those in the beach front resort centre, which include fish, seafood, and Mediterranean cuisine. Vale do Lobo is around 20 minute drive to the larger resort of Vilamoura, which offers a bustling harbour, with an abundance of activities for families and couples alike. It is also only a 5 minute drive to the exclusive Quinta do Lago, which has many fine restaurants in the resort and along the road from Vale do Lobo to Quinta do Lago. We have in the house a folder detailing many restaurants and bars in the area. We have owned our house in Vale do Lobo for 14 years. We live in the UK full time, although like to visit Vale do Lobo as often as possible. Both of our bathrooms have just been completely renovated and are now of the highest standard. There is also now very close to the house a small child's play area, consisting of swings, climbing frame and slide. Great to keep the kids happy although not intrusive on the houses location. The location of the house is both quiet and peaceful although still extremely well located to access all of the fabulous facilities of the resort. Fantastic resort, with something for everyone. Our 10 year old boys played football and/or tennis most days and loved the dancing/singing outside Monty’s Bar of an evening. Great beaches and a variety of pools to choose from. We found the quieter location ideal for us, as we have a 7 month old baby. She slept well which meant we all did! The rooftop terrace, with sun lounges was an excellent place for my husband and me to unwind, look at the stars and enjoy a glass of wine, while the kids slept. Overall the villa was clean and well equipped. The Sky TV and Dining area was ideal for those nights when we wanted to cook indoors and chill. Summer house in excelent conditions with an exceptional location. I have the intention to return soon. Vale do Lobo is one of the longest established and best known developments in the Algarve and retains its high reputation by continually maintaining and updating the resorts facilities and image. The luxury resort was founded in the 1960s and remains to this day a high quality holiday destination for holiday makers of all ages. Vale do Lobo is easily accessible as it is located at just 20 minutes west from Faro International Airport which benefits from many direct flights from most European cities and major airlines. Getting to and from the resort could not be easier, you may wish to have the flexibility and freedom offered by Car Hire, alternatively we can arrange taxis and transfers for you. Our house is located 2 minutes away from the fantastic tennis academy in a quiet but conveniently located area. There is a small children's play area near the house and each of the fabulous beaches are a 2 minute drive away.